Bruce Banerdt, InSight principal investigator and principal research scientist at NASA’s Jet Propulsion Laboratory. 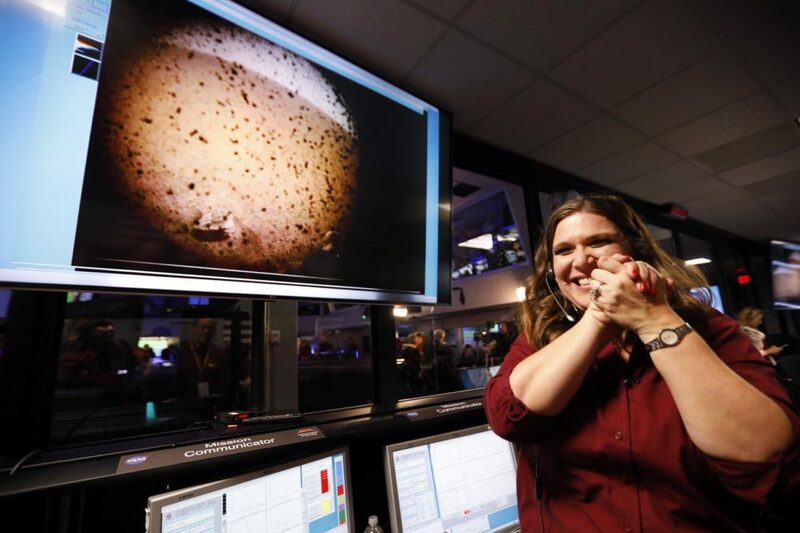 Elizabeth Barrett, science system engineer for NASA’s Jet Propulsion Laboratory on the InSight mission. Space.com: "InSight Mars Lander Unfurls Solar Wings Amid 'Quiet Beauty' of Red Planet" — "After a dramatic and exhilarating landing on Mars, NASA's newest Martian robot InSight has found some serenity on the Red Planet. And now, it's soaking up the sun. "The InSight Mars lander has successfully unfurled its two fan-like solar arrays, allowing the robot to generate the power it will need to study the Martian interior for the next two years, NASA officials said late Monday (Nov. 26). NASA received confirmation that the solar arrays were deployed at 8:30 p.m. EST (0130 Nov. 27 GMT), about five-and-a-half hours after InSight landed on Mars. "Each of InSight's two solar wings are 7 feet (2.2 meters) wide. When unfurled, the arrays give the lander a wingspan equivalent in size to a 'big 1960s convertible,' NASA officials said in the same statement." National Geographic: "New Mars lander safely touches down. What happens now?" — "After a 205-day journey through space, NASA’s InSight lander is safely on the surface of Mars. 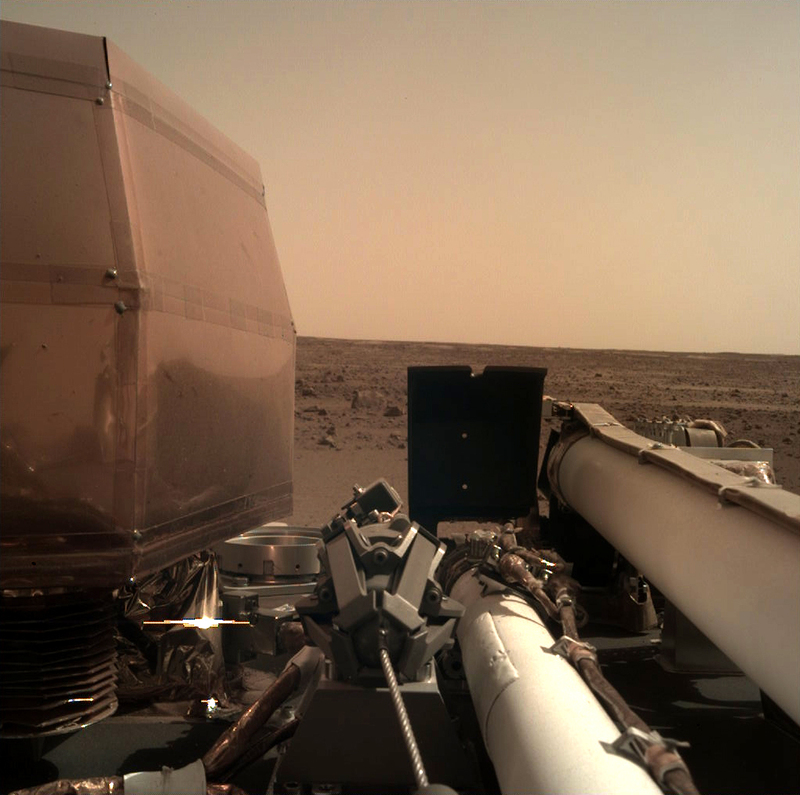 Tasked with peering beneath the Martian surface and mapping the planet’s underworld, InSight touched down at 2:52 p.m. ET in a sunny patch of boring landscape inside the equatorial plains of Elysium Planitia. "Anxious teams of scientists and engineers, clustered together at the Jet Propulsion Laboratory in California, knew the spacecraft had survived its wild and tricky descent to the red planet’s surface after receiving data suggesting the lander had touched down safely—followed by an image from InSight itself showing a dusty, alien horizon with a single robot foot." The Atlantic: "The Dawn of Interplanetary Geology" — "After Earth, Mars may be the most well-studied planet in the solar system. "Since 1965, humankind has sent spacecraft after spacecraft to examine our celestial neighbor. The flybys captured the first close-up photographs of the Red Planet, revealing a rocky, cratered surface. The orbiters found towering volcanoes, dried-up riverbeds, and enormous storms that choked the thin atmosphere with dust. The landers searched for signs of life in the cinnamon-colored soil but found none. The rovers carved tire tracks into the ground and detected organic molecules embedded in 3-billion-year-old rock, a sign that perhaps some beings may have existed long ago. "But even after more than 50 years of research and exploration, our understanding of Mars remains surface-deep. Spacecraft have drilled into the rock and scooped up soil samples, but they haven’t made it very far." 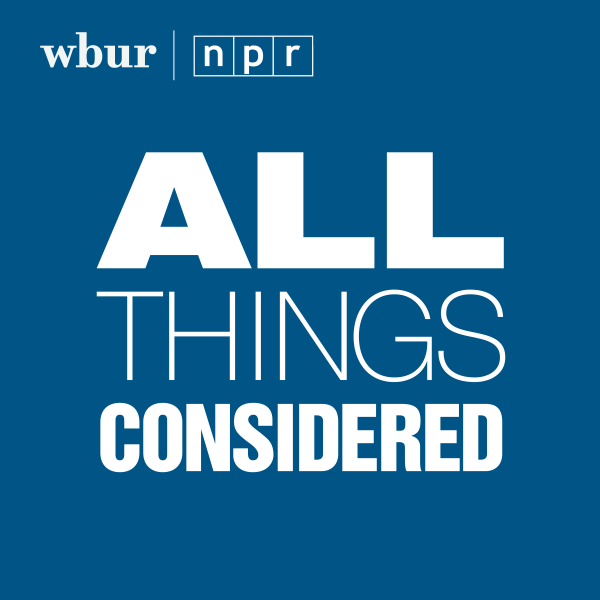 This program aired on November 29, 2018.